The House of Representatives at its emergency meeting has today suspended the embattled Hon. 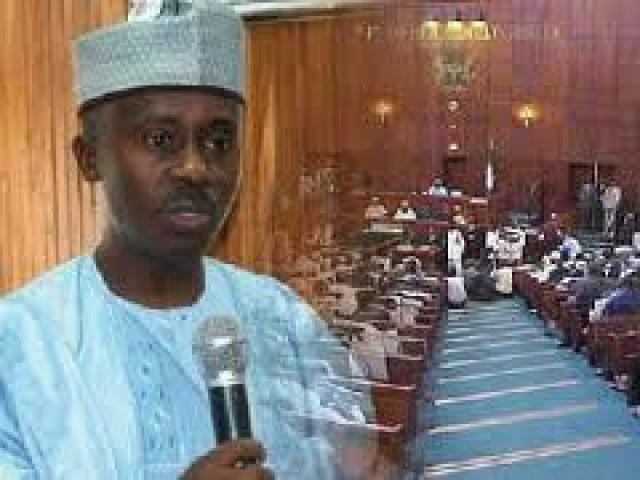 Farouk Lawan as chairman of the bribery allegation riddled fuel subsidy probe committee. Lawan is also suspended as the Chairman of the Education Committee of the House. Farouk Lawan is facing allegations of demanding $3million bribe from Femi Otedola Zenon Oil. Otedola said Lawan collected initial payments $500,000 while he sent Emenalo to collect $120,000 at a later date. The Speaker of the House of Reps, Hon, Aminu Waziri Tambuwal appointed Hon. John Enoh (PDP, Obubra, C’River) to replace suspended Farouk Lawan. Enoh now heads the Adhoc committee on subsidy. The House also mandated its committee on ethics to look at the allegation made against Farouk Lawan and its committee. Speakier of the House Hon. Tambuwal ordered the Management of National Assemblyto investigate the embattled Secretary of the subsidy probe panel and staff of the National Assembly, Boniface Emenalo. The Company in the midst of the bribery allegations, Zenon Oil, owned by business tycoon Femi Otedola, has been asked by the House to pay back $232m to federation account. Tambuwal says the House will stand by the Report of the fuel subsidy probe. In another twist to the bribery saga, legislators passed a vote of confidence on the leadership of the house led its speaker Hon Speaker Aminu Waziri Tambuwal. So the hunter becoming the huntered…what a country were you can’t have people of integrity but i doubt if Farouk had committed this unwholesome act, time shall tell. God save my country!! So at last, bushmeat is about to cach the hunter. Will back hand business ever come to an end in NIGERIA? Really? Is it true or its just a way of getting him outta d way so d bribery can actually go on,he was doin a fine job.they probably underestimated him n now they dnt want him.y did zenon oil pay(dat is if they actually did).last I checkd bribery is a crime. If the like of one of the most regarded outspoken members of the house is now a thief. The fact now is that his constituency has been misrepresented for 13yrs only God knows how many of his likes are yet to be exposed. We are in a despair at the moment only God can save us. SCALING HEIGHT ON THE WINGS OF CHARACTER. One of the most important asset of anybody on earth is character. One of the worse losses anybody can incure on earth is the lost of character. You can not succeed without a good and constant character,the reason why you most posses a consistency of character is,if character is intacked destiny is intacked. What we need in Nigeria now is change of character. You hear people rebagging cement,lecturers sleeping with students to award marks,pastors stealing money from the church, politicians just out for their pockets, and all manner of evil acts in Nigeria, all these are signs and symptoms of a generational epidemic of character bankruptcy. Billy Graham said ‘IF YOU LOSS MONEY YOU LOSS NOTHING, IF YOU LOSS HEALTH YOU LOSS SOMETHING,BUT IF YOU LOSS CHARACTER YOU LOSS EVERYTHING’. 1. Character is a distinctive identity- what you are know for. 2. Character is your attitude and action in secret- who you are when no one is watching. 3. Your character is your behaviour under pressure. The only thing we need in nigeria today is just CHARACTER! GOD BLESS NIGERIA. BY Chijioke Igbokwe. Abuja-Nigeria. Hon. Farouk Lawani should be hang as the first nigeria to crate fear into our soceity. Because corruption in these country is sky rocketing every hour.A searching Dog that was behind the killing.